The users are not required to enter the theme coding part. They just have to upload their logos by the click of a single button and rest of the work is done by the theme itself. You will be able to display your work with the help of unique portfolio template page option. There are three column layouts to select from. You can display some client testimonials using this theme. 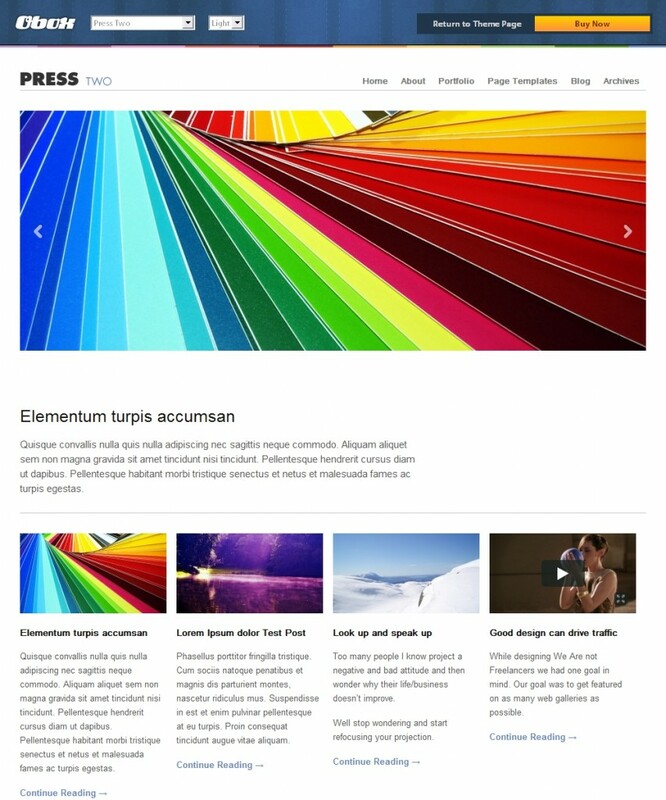 The PHP, HTML, and CSS code has been rewritten so that the best theme could be presented. Without changing the design, the post page information has been squeezed. You can select between light and dark colour schemes which are not only classy but very easy to modify. The users will get unlimited page templates to use. Moreover, the users can easily customize these templates to suit their website’s needs and requirements. Basically there are four page templates offered and these are contact form, blog page, archives page, and no sidebar page. The users can also create their own page templates as well. To provide smooth navigation to your website visitors, you can organize the menu according to the needs and requirements of your website with the help of menu management feature option available with this theme. Setting up of BuysellAds advert is simple to run on the custom campaign, because OCMX provides the Advert management feature which will help to attain full revenue system control. When the visitor will submit a comment to the blog, then page reloading will not be required. This means that the visitors will be able to watch the videos as well as perform commenting at the same time. You can continue with your website’s brand with the logo uploading feature supported with this theme. Now you can store many logos and utilize them whenever you want to. The users can manage and upload favicons on their own to their website so that your brand can be instantly recognized on their visitor’s browser. A simple checkbox with multiple colour options is available which will switch through options so there is no need of changing the code anywhere. Google Analytics code can be inputted easily with a single hit. You can translate the theme into any language and easily work with it. There are around 36 Google and standard fonts available for you to choose from. Moreover, the font size and colour can also be chosen as per the requirements with the help of the slide controller. You get the opportunity to view the page you have created after careful selection using the unison option. This will also give you the idea about the selections and combinations and whether or not they suit the website. The typography master continuously will update the theme with new fonts whenever they are added to the Google’s font list. The users get to create in-house galleries so there is no need to take support of any website. First make the slideshow yourself and include it in your website. Now you will get an increment in web traffic because your fans will not go to any other website for viewing your images. With the simple drag and drop feature, users will be able to move around their galleries without the need of non-user friendly methods or changing creation dates. Deletion of unwanted images, renaming of images, and setting of gallery covers can be done using this feature. The users can manage and control all the Ad space available on their website and make some money. The advanced management tools will help you in doing this and thereby getting your money invested in the theme back. The two block sizes which are supported by this theme include 125×125 and 300×250. You get the provision to include third party advert scripts like buysellads, Google adsense, etc. Control the complete layout of the homepage with the help of three default settings provided with powerful widgetized settings. The users can stick with standard layout for which the theme was designed originally and conceptualized for. Business or corporate oriented website can be obtained using this theme just by clicking a button. The users can control their homepage wholly using the OCMX widgets. These widgets will help them determine their website’s look and feel along with order and functionality of the landing page. The easy to use SEO and lightweight features will surely increase your website’s ranking from the targeted keywords. For quick testing and editing, the light weight tools are provided which are easy to use and understand. The threaded comments feature will help you connect as well as interact with readers easily. You can also keep a record of who is saying what and to whom. The number of levels can be set and accordingly the conversation takes place. The Ajax commenting feature allows users to come closer to their visitors. Ad listing is separated from blog posts so less confusion will arise. With the Ad listing management, it becomes easy to track and manage the Ad lists on the website. The custom archive page template can be designed for good looks and usability. The theme provides custom search page result template. The sidebar widget can be used for latest posts where design customization is possible, and recent comments where you can display the list of recent comments using the custom designed widget. To display the latest products and work posts, a neat homepage slider feature is provided with this theme. The details of the post authors can be displayed and hence it will be a blogger network. The theme is filled with numerous features and every possible feature is included which the users need for creating a powerful website. The SEO related features will help to boost web traffic to your website and thereby increasing your business opportunities. Some designers feel that the loading speed of this theme is not very fast. They complain of that including large amount of data and images, affects the website loading speed considerably.